The May The Holo Hookup Box is available NOW and is SELLING OUT FAST! Available NOW!!! The Holo Hookup Box is hooking you up this month with 4 new AMAZING holos! This month's theme is Off to Broadway! 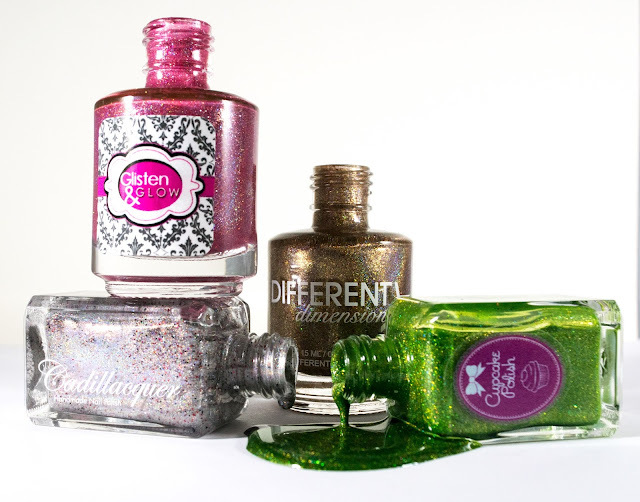 These 4 exclusive holos are created just for you by Cupcake Polish, Glisten & Glow, and Different Dimension and our guest Cadillacquer. Get your box today or risk it selling out for good!! The Cupcake Polish featured in this month is called Defying Gravity and you do NOT want to miss out on this beauty! Defying Gravity is a gorgeous bright neon green linear holographic nail polish with gold shimmer and silver holo microglitters. This polish is one of my personal new favorites and I know you will love it too! This month's boxes are ready to ship immediately! So much prettiness in one box! Cirque Colors - Mystery packs are back!